Stihl’s $25 million administration building project is part of the company’s commitment to growing U.S. operations. 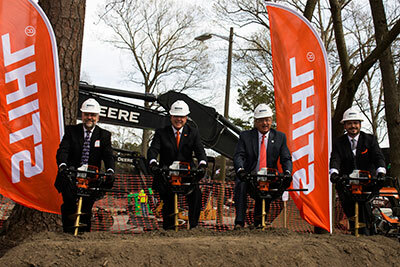 Stihl held a groundbreaking ceremony to mark the beginning of construction on its new administration building and other campus improvements at Stihl headquarters for the U.S. in Virginia Beach, Va. The $25 million administration building project is part of the company’s investment in growing U.S. operations. In addition, there will be significant improvements to an outdoor demonstration area for hands-on training, enhancements to the entry guard house and updates to traffic flow and security at the main entrance gate. During the celebration, local dignitaries including the mayor of Virginia Beach, members of City Council and representatives from Virginia Beach Economic Development participated in a symbolic groundbreaking and learned more about the project. Since its inception in 1974, the campus has grown from a single 20,000 square foot rented warehouse to more than 1 million sq. ft. of manufacturing and administrative space on more than 150 acres. With the construction of the new 80,000-sq.-ft. administration building comes a Stihl museum and customer welcome center and other campus upgrades. Virginia Beach-based Hourigan Construction, a firm with extensive experience in construction management, and specifically, corporate headquarters facilities, is the general contractor for the project. Another Hampton Roads company, HBA Architecture Interior Design, is the lead architect, and Virginia Beach-based Creative Development Partners will serve as the owner’s representative. The expansion will replace the former 21,000-sq.-ft. administration building, which was razed to make way for the new building. The anticipated completion date of the new building and other campus improvements is mid-2019. Doosan Bobcat North America‘s Acceleration Center—an engineering facility for all Bobcat compact equipment—is now Leadership in Energy and Environmental Design (LEED) certified. Located in Bismarck, N.D., the Acceleration Center is currently one of only a few test lab facilities of its kind in North America to achieve LEED certification, a globally recognized symbol of sustainability achievement. The state-of-the art building earned high marks across several categories, including design and innovation and indoor environmental quality. Doosan Bobcat completed the $28 million renovation project in 2015, which involved the expansion of an existing building to include office and lab space, classrooms and demonstration areas and both indoor and outdoor machine operation areas. The facility has two stories and 190,000 sq. ft. under one roof, with an additional 22 acres of outdoor test and product development space. LandCare held its fourth annual leadership conference in San Diego, bringing together 100 leaders from across the country for a three-day event filled with learning and networking. The first day included an opening session with a business review, a branch manager panel discussion and a welcome beach party at Mission Bay Park. The branch manager panel discussions focused on team member engagement, customer service, new sales and improving financial performance. Also during the event, LandCare’s executives, trainers and guests led breakout sessions covering managerial topics with an emphasis on companywide goals. PBI-Gordon Corp. plans to relocate its corporate headquarters from Kansas City, Mo.’s West Bottoms to a new facility in Shawnee, Kan. The company plans to move into the new headquarters before January 2019. PBI-Gordon has approximately 400 employee-owners located in facilities in Kansas, Missouri, Illinois and Florida. About 100 employee-owners will move to the headquarters in Shawnee.